Are you up to the task of writing? Are you equal to the task of hosting a dinner party for 12 people? What about playing a piano concerto for an audience? What about running a 10-km race? All of these tasks require different training, skills, experiences and attitudes. They sound as different as chalk and cheese or a hot dog and a hot potato. But I can tell you one thing these tasks have in common. They all require CONFIDENCE. If you don’t have confidence, you won’t be able to do any of them. I raise this issue today because last week one of my clients told me she wasn’t sure she was equal to the task of writing a book. Ironically, she made this comment directly after outlining a smart and thoughtful plot, with interesting characters, a good source of conflict and excellent rising action. (When I heard it, I told her it sounded like the kind of novel Barbara Kingsolver might write.) But, still, she was concerned she might not be up to it. Since speaking with my client, I’ve been reflecting on why this kind of crisis of confidence is so common among writers. Not everyone phrases the concern as succinctly as my client did (I love that turn of phrase, “equal to the task,” which suggests something both daunting and important.) Instead, more people use words like “worried,” “disquieted,” “fearful” or “inadequate.” But the feeling is the same. I think this discomfort is unique to people who work in the arts. Even famous and successful artists have suffered from it. 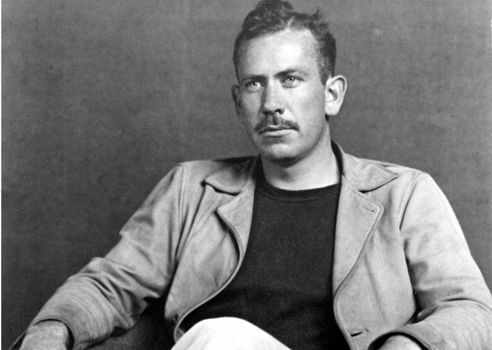 Take John Steinbeck (pictured above) for example. In the late 1930s, while working on his famous novel The Grapes of Wrath, Steinbeck wrote: “Sometimes, I seem to do a little good piece of work, but when it is done it slides into mediocrity.” (He earned the 1962 Pulitzer Prize for that book.) Other artists who suffered from self-doubt were: Leonardo Da Vinci, Michelangelo, Vincent Van Gogh, George Eliot, Edith Wharton, Jackson Pollock and Maya Angelou. Remember, you can do only one thing at a time. Whenever we feel pressured, our self-doubts have the most power. The solution? Dial down the pressure. Instead of focusing on what we’re going to publish — i.e., the final product — we should focus instead on the act of writing. How can we make it more enjoyable? How can we make ourselves more productive? We shouldn’t worry about publishing (or even about editing) when we’re writing. That is a concern for another day. As writers, we should avoid multitasking and, instead, focus on the simple act of putting words on paper. Deal with negative thoughts immediately. Negative thoughts build quickly upon each other if we’re not mindful about them. Did you know that according to one researcher we speak to ourselves at an average speed of 4,000 words per minute, or 10 times faster than verbal speech? And much of this self-talk is shockingly negative. But there’s a quick fix psychologists suggest for combatting negative self-talk: the three Cs. Here’s how they work: Catch your negative thoughts. Check your thoughts for truth. Change your negative thought pattern by re-wording the thought to something more positive. Learn more about the three Cs or check out my post on Cognitive Behavioural Therapy for writers. Also, be aware that negativity is like the flu — very contagious. Try to surround yourself with positive, motivated and supportive people. We’re all going to have bad days from time to time, so it’s important to spend less time with the chronic complainers. Make time for your writing. It’s pleasant and enjoyable to let random ideas for a book or story flit through our brains. Just remember, that type of daydreaming doesn’t count as writing until you actually get some words on paper. If writing is important to you, be sure to make time for it. This commitment is not even as daunting as it sounds. If you write 250 words every day for a year (and maybe you can do this in 15 minutes daily) you’ll have 91,000 words by next February. That’s more than enough for a book. But you have to write them. Stop trying to impress others. Don’t worry about what others think. Yes, they may ultimately be impressed by what you write. But that positive opinion is far less important than what you think of yourself. Focus on your own goals, objectives and aspirations. This will be far more meaningful to you than what others think. Don’t expect perfection. People who expect to be perfect usually repress feelings of self-doubt. But here’s the double-edged sword: this repression usually just brings on more feelings of worthlessness. Don’t get caught in the slipstream of perfectionism. We all make mistakes and errors but we can all learn from them. Trying to be perfect hinders our ability to accomplish things. Sometimes good is good enough. If you ask yourself whether you feel up to the task of writing a book — and the answer turns out to be ‘no’ — use these five strategies to improve your odds of succeeding. My video podcast last week aimed to help academic writers improve their thinking. See it here and consider subscribing. If you have a question about writing you’d like me to address, be sure to send it to me by email, Twitter or Skype and I’ll try to answer it in the podcast. How do you help yourself feel up to the task of writing? We can all learn from each other so, please, share your thoughts with my readers and me in the “comments” section, below. And congratulations to George Hume, the winner of this month’s book prize, Talent Is Overrated by Geoff Colvin for a Jan. 9/18 comment on my blog. Anyone who comments on today’s post (or any others) by Feb. 28/18 will be put in a draw for a copy of The $100 Start Up, by Chris Guillebeau. To leave your own comment, please, scroll down to the section, directly underneath the “related posts” links, below. Note that you don’t have to join the commenting software to post. See here to learn how to post as a guest.